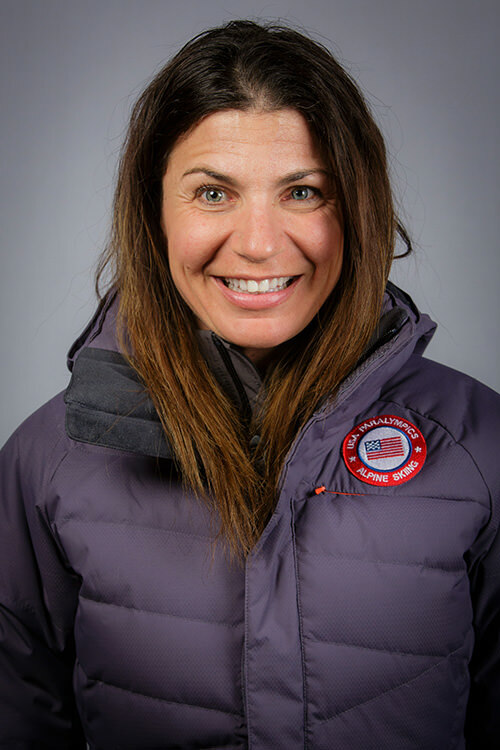 Danelle Umstead of Park City Utah will be a key U.S. skier to watch for at the Paralympics in March in Sochi, Russia. 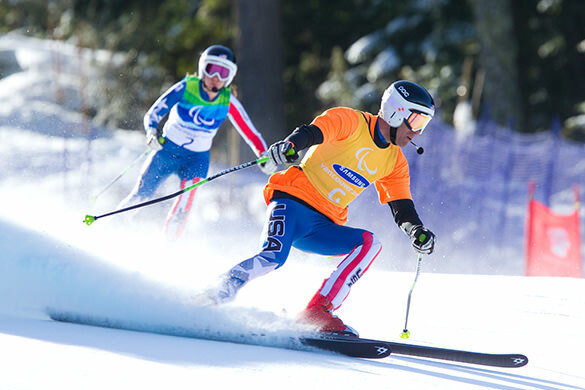 The sight impaired Umstead left her mark at the 2010 Paralympic Games in Vancouver, Canada, when she and her fully sighted guide/husband Rob Umstead won two bronze medals in skiing; downhill and super combined. Now she and her husband are aiming for Paralympic gold. There is more to Umstead's story than racking up medals. As an adult, she had to adjust to losing a huge portion of vision coupled with developing multiple sclerosis. Danelle, now 42, remembered how she started to ski: "It was 2001. I lost my mother and I learned that I had retinitis pigmentosa [an eye disease that leads to blindness]. My father [Peter D'Aquanni] offered to give me ski lessons." At first, she was hesitant. "I didn't think that blind people could do anything," said Danelle. He promised to be her eyes and emphasized that she would enjoy it. He was right. After a short while, she was hooked. Skiing made her feel free again like when her vision was perfect. While skiing in Taos, New Mexico she met her future husband Rob. 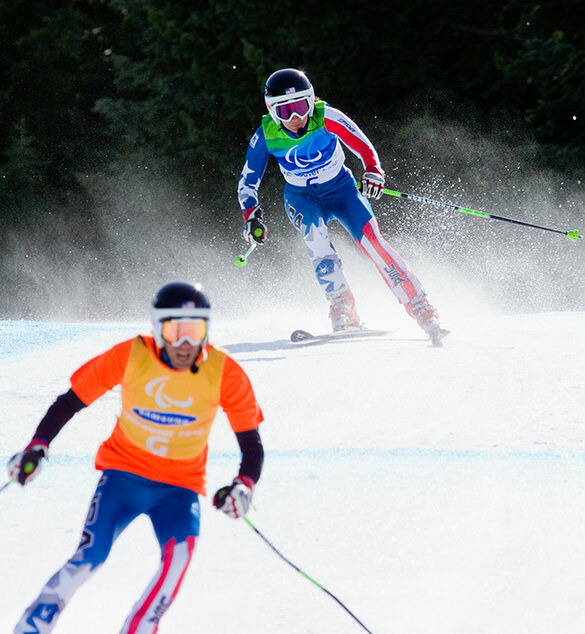 Danelle Umstead began competing in sanctioned ski competitions for the blind in 2007. In 2010, she and her husband earned Paralympic spots. Winning Paralympic bronze was a proud moment for her. Danelle remembered, "It was awesome that Rob and I, as a family and as a team, won a bronze medal [in combined skiing]. All our hard work paid off. Having the medals put around our necks and being told that we made our country proud was an honorable moment." Unfortunately, 2010 also had its share of lows for Danelle. A few months after the Paralympics, she learned that she had MS; she refused to let it stop her. Working with a physical therapist, a chiropractor, and a sports psychologist contributed to her returning to the ski slopes. In 2013, Danelle and Rob won their first downhill ski race ever; it was in Sochi, Russia, the site of the upcoming 2014 Winter Paralympic Games. "It felt great," said Danelle. "All those hours of hard work and sweat really paid off." Umstead's training regimen for the upcoming Paralympics is different this time around. 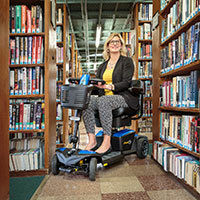 "Because of my MS, I have to be more aware of how my body moves." Pilates is also part of her training routine. Danelle and Rob founded team Vision4Gold. "Vision," said Danelle Umstead, "is to have sight, an idea or a dream." It began with her vision for gold at the 2010 Paralympic Winter Games. Her advice for people with disabilities who lack confidence to take part in sports: "It's about getting out there and trying. Once you try, you won't believe the possibilities." She concluded the interview by thanking the United States Association of Blind Athletes (USABA). She likes how USABA looks at blind and visually impaired athletes as athletes and their capabilities. There is a message to Danelle Umstead's story: Anything is possible. She learned that firsthand when she took up skiing 13 years ago. For more information about Danelle Umstead, log onto www.Vision4Gold.org. For more information about USABA, log onto www.usaba.org. David Block is a freelance journalist and documentary producer/director who is legally blind. For more, visit www.blindfilmmaker.com.